What is Anthem Fort Tarsis? 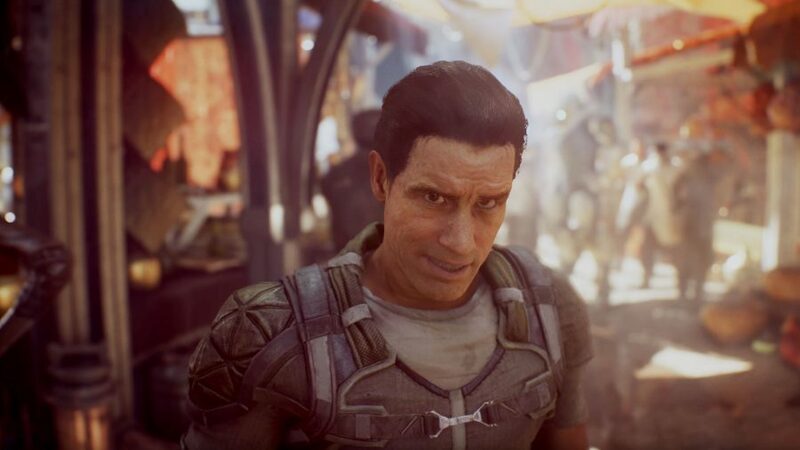 Anthem’s Fort Tarsis area still has a lot of prospective buyers confused with its first-person perspective, rich conversations, and NPCs – it looks nothing like the rest of the game. While the bulk of Anthem sees you and your pals soaring around a gorgeous open world in rocket-powered suits of armours, obliterating enemies with enormous cannons, BioWare are using Fort Tarsis as a single-player hub where you can lose yourself in conversation to NPCs and craft essential gear. While BioWare is designing Fort Tarsis as a non-combat space for single-player storytelling purposes, there will be a Launch Bay area similar to Deestiny 2’s Tower where you can flaunt your Anthem Javelin and hang out with friends. So, what do you actually do in Fort Tarsis? A recent IGN First video as well as a BioWare livestream have revealed some of the characters and activities that will keep you busy in the citadel, and even teases some of the ways in which Fort Tarsis will transform as you progress through Anthem’s campaign. Join us as we prepare you for the Anthem release date by running you through everything you need to know about Fort Tarsis, from vendors to key locations. The Anthem Launch Bay social hub is a little separate to Fort Tarsis itself and you’ll need to go through a load screen every time you move between the two zones. The key difference between the two locations is that in the Launch Bay you can show off your Javelin and emote with your friends. The Launch Bay also carries all of the essential mission-to-mission functions that Fort Tarsis does: Alliance standings, challenges, the Vault, check the Contracts board, buy cosmetics at the Vanity store, or even upgrade your Javelin at a Forge. This is a match-made space that holds up to 16 players and also boasts most of the features you will need from Fort Tarsis itself, except for specific quest givers. 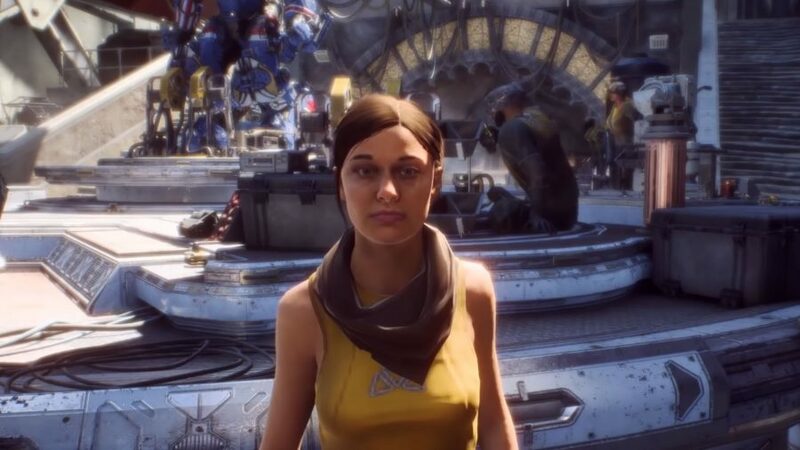 If you’re really not interested in the story side of Anthem then this is the place you’ll want to hang out between missions. Zoe is a Javelin mechanic and will repair your Javelin and fit upgrades while you’re in Fort Tarsis. Prospero can be found at the Bazaar and deals in cosmetic upgrades for your Javelin, ranging from custom decals to bodywork. He is involved in the ‘Lighting a Fire’ quest in which you must collect 3 embers in order to fuel the Forge. Here are some of the other Fort Tarsis characters you will come across in Anthem’s hub area. Fort Tarsis is defended by a faction known as the Sentinels, and Commander Vul is their leader. The Sentinels view Freelancers as unreliable mavericks so expect a frosty reception from this chap. A spy for the Corbis faction who will produce the odd contract for the Freelancers. A Sentinel member who is much warmer to Freelancer than others in her faction, Brin will routinely pop up on your radio feed to give you information. Your personal Cypher, Owen is an ambitious and eager member of your Strider who is in charge of delivering important intel and analysis while you’re on missions. 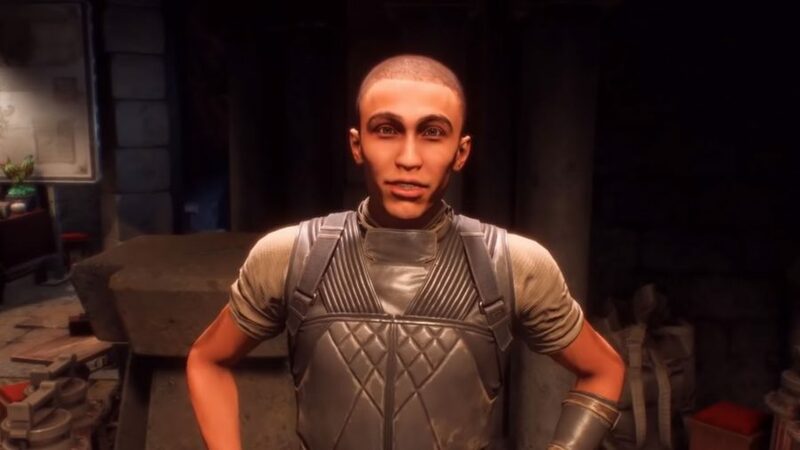 Yarrow is a key member of the Freelancer faction and will eventually become your point of contact for Legendary Contracts after you complete a number of side quests for him. The leader of the Arcanists, a faction of researcher-monks dedicated to discovering the mysteries of the world and preserving knowledge for future generations. Mathias must first be rescued before he will appear in Fort Tarsis, and after doing so he becomes a quest giver just like Yarrow. When you first arrive in Fort Tarsis you will only have access to a few key areas: Forge, Freelancer Enclave, Vault, Market, and Scrapyard. 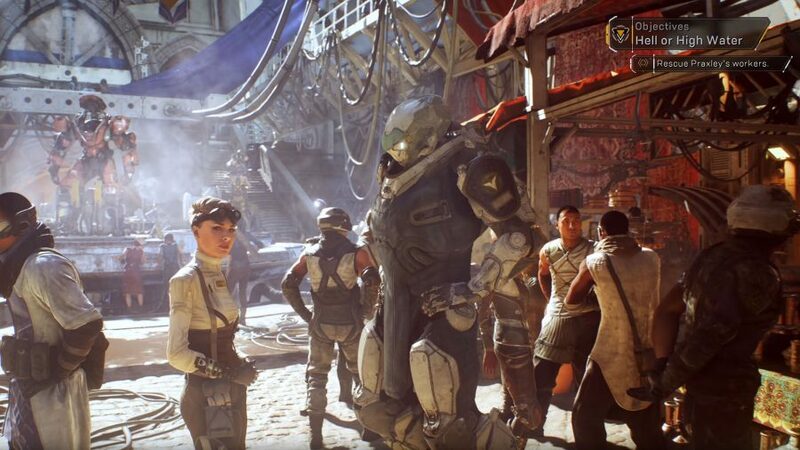 These areas will change significantly as you progress through Anthem’s story, opening up new market stools, clearing out clutter from key rooms, and essentially reflecting all the good work you’re doing out in the wider world. The Forge is where you’ll find Zoe and will be where you commission repairs for your Javelin. The Freelancer Enclave where you can track main missions, meet key characters, and check your challenge progress. The Vault is where you store your loot, but only has limited space, which means you’ll need to craft, scrap, and manage your resources and treasure at this spot. The Market is, obviously where you can buy and sell various wares. The only stall we’ve seen open is Prospero’s, but a devstream mentioned that there are two other stalls that are closed early on in the game. The Scrapyard is where Striders are decommissioned and scrapped. 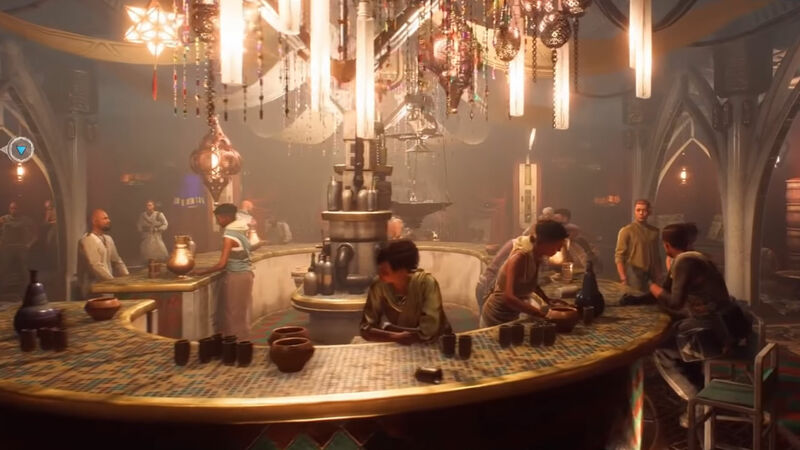 Most of Fort Tarsis is locked off when you first encounter it, but once opened up you’ll have access to a large courtyard and an opulent bar that houses some of the citadel’s most eccentric characters. This is pure speculation, but perhaps one of these unlocked areas will be a multiplayer hub area where you can show off your Javelin to friends and strangers alike. As endgame starts around level 30, it’s likely that this is the point where Fort Tarsis will open up completely to players. So what is Fort Tarsis anyway? In the world of Anthem humanity has fallen on pretty hard times. Fort Tarsis is one of the last remaining fortified settlements and houses a variety of social classes in a very small space. Tarsis gets its name from the General Helena Tarsis, the Legion of Dawn leader who fought to save humanity during its darkest chapter. She died fighting to protect humanity, and so the citadel was named in her honour.